The world of jazz is destined to cope with it the unsolvable dilemma that exists between the importance that is assigned to improvisation and the fact that many fans of this genre of music, for obvious reasons, will only listen to albums that were realized within a recording studio, which certainly is not the ideal environment for a musician who wants to release all of his creativity. When they are in the recording studio, many musicians don’t feel the unique and thrilling atmosphere of a live performance, where a myriad of factors that aren’t reproducible in the studio can lead the artist to reach that state of inspiration in which improvisation can arrive to the highest peaks. Fortunately, however, many albums in the history of Jazz have managed to mitigate this paradox. 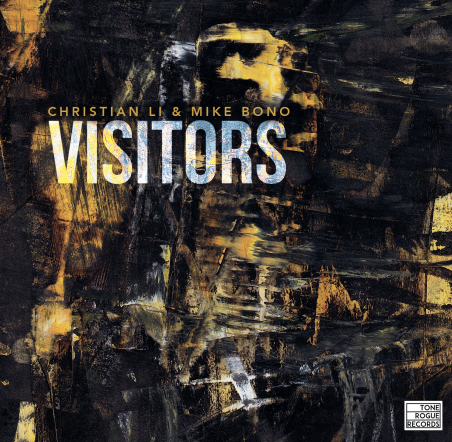 One of the last cases is given by a new record that’s named Visitors, which is the first joint work from a duo of talented North American musicians: pianist and composer Christian Li, born in Canada but living in New York City for years, and New York City guitarist Mike Bono. First of all it should be noted that the combination of piano and guitar is not the most common one in Jazz. In the case of Visitors, the two musicians managed to create together something very special and in many cases this happens thanks to the particular technique that’s used by Christian Li. Instead of being limited to the conventional repertoire of the jazz pianist, Li is often engaged to create a sort of “carpet of sound” by playing fast and small scales and using repeated touches on tight chromatic intervals. In the meantime his left hand beats and reinforces the syncopated rhythm of the song. On top of that layer of piano, Mike Bono’s guitar is free to play intriguing solos and sweeps of exquisite workmanship. In other moments the two leaders chase each other through risky scales, or play in the background to give the scene to the other musicians who’re participating in the building of the song. Visitors, in fact, sees the collaboration of an ensemble of heterogeneous musicians. We have Dayna Stephens on saxophone, Jared Henderson on bass, Jimmy Macbride and Lee Fish on drums, but we enjoy also the presence of Alex Hargraves on violin and Chris Marion on strings. An unwritten rule of jazz says that the greater the number of musicians, the less the individual interpreters can improvise. Visitors seems to be a nice exception to the rule, and this is obviously due to the skills of the individual artists, but also presumably to the wisdom of who was on the production side and created the conditions necessary for the musicians to express their best. As a matter of fact, Visitors brings with it the energy and the emotions of a group of talented musicians who are thrilled and delighted in playing together a music without strict borders. In each of the tracks of the LP there is an initial idea which is shared and agreed by the various instrumentalists, and from there we enjoy a whirlwind of interwoven colored lines that first compose and then untangle an ever-changing picture on a canvas. Visitors is the first record of 2019 that made me experience the thrill and beauty of jazz improvisation. And it’s certainly a promising debut for the duo of jazzists who have led the project. My rating is a convinced 7.5/10. Visitors is available on bandcamp and it can be streamed from Spotify. My favorite songs of the album are Awake, Space Invaders and the opening song Puddles.